Star columnist Raymond Clapper, December 2, 1941. Five days before the attack on Pearl Harbor, Clapper sounds the alarm about Japanese militarism. Front page from December 8, 1941, the day after the Japanese attack on Pearl Harbor. The December 8 issue also carried this article by Japanese American journalist and community leader James Sakamoto. In it Sakamoto assures Star readers of the loyalty of the Japanese community to the United States. James Sakamoto, pictured in the Seattle Star on December 31, 1941. In the wake of Pearl Harbor, Seattle authorities detained 51 "Japs." 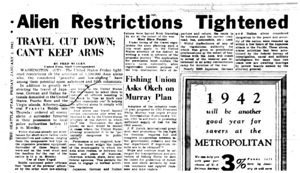 On January 2, 1942 the Star reported increasing restrictions for Japanese and others hailing from Axis nations. 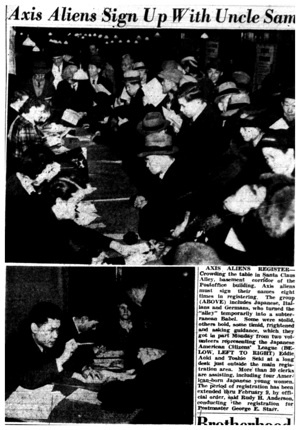 Photographs from the Seattle Star showing local "Axis Aliens" registering with the Federal government in early February, 1942. 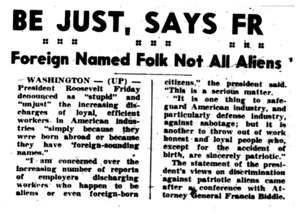 Just weeks before he would establish the wartime interment camps, FDR spoke out against employers who were firing "loyal, efficient workers" who happened to have been born abroad. 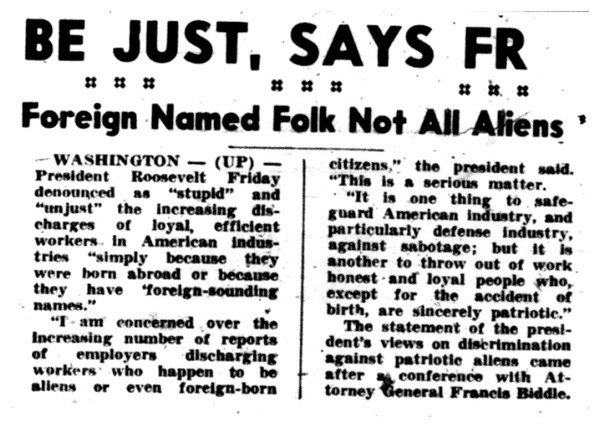 On January 9, 1942 the Star defended itself against accusations it was fomenting hatred and urged readers to follow FDR's admonition against discrimination toward loyal aliens and foreign-born citizens. Above: syndicated columnist Walter Lippman's call for the removal of all Japanese from the Pacific Coast was featured in the Star on February 13, 1942, less than a week prior to FDR's executive order setting up the internment camps. Below: the Star's editors back Lippmann's position, calling his view "harsh" but "necessary." A February 18, 1942 article announcing that Japanese American citizens, along with alien Japanese, will be evacuated to internment camps. “Oust Seattle Enemy Aliens” read the _Seattle Star_’s front-page headline on February 16th, 1942. It was just over two months since the surprise attack on Pearl Harbor and the outbreak of war with Japan, and local sentiment ran high against local Japanese and Japanese-American residents. The Seattle Star, a popular daily newspaper published from 1889-1947, provides an excellent window into the question of how such strong anti-Japanese sentiment arose in the months between the attack on Pearl Harbor and the issue of Executive Order 9066, which established the federal wartime internment camps. 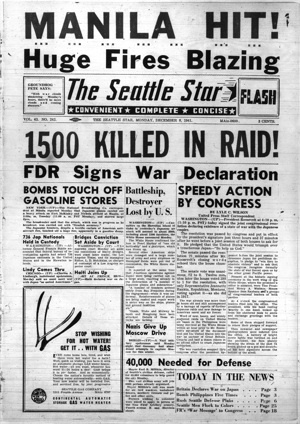 This essay examines the Seattle Star from December 1941 through February 1942, focusing on the Star’s reaction to key events such as the bombing of Pearl Harbor and the issue of Executive Order 9066 and, in particular, on the paper’s hostile and sometimes racist portrayal of native Japanese and Japanese-Americans, especially after the paper was sold in January 1942. By analyzing letters to the editor during these months, this approach also allows us to discover the local non-Japanese population’s views on the war and the idea of internment. The Seattle Star was a locally owned paper, first published on February 2, 1899. In 1909 it was sold to the E.W. Scripps family. 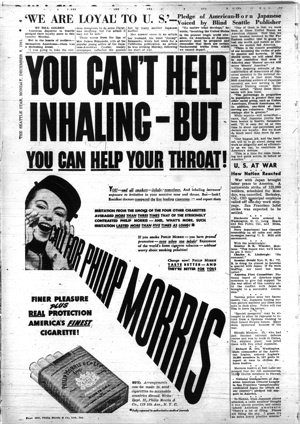 Then, in January 1942, it was sold to Howard W. Parrish, a one-time employee of the Star. It ended publication on August 13, 1947 due to increases in labor costs and a shortage of newsprint. Recently, another paper under the same name began print but there is no connection to its namesake. Although it did not have as large a staff, circulation, or readership as the Seattle Post Intelligencer or the Seattle Times, the Star still managed to reach people throughout King County as evidenced by, among other indicators, the locations of writers to the editor. In December 1941 Japan was a nation full of desire for national power, respect, and supremacy. It wanted to achieve equal footing with the Western Powers and revise the unequal treaties that it had signed with those nations in the past. Following the precedent of Europe and the United States, it began to industrialize in the late 19th century and was the dominant imperial power in Asia by the early 20th century. Historian Kenneth B. Pyle has implied that because of Japanese ambitions and the overall climate of militarism of the 1930s in both Europe and Asia, the “road to the Pacific War” was one that could not be have been avoided. Pyle also shows how the anti-Asian racism that would be thrust to the surface by Pearl Harbor had deep roots. Racial tensions first began to develop on the United States western coast between white Americans and Japanese immigrants in the late 19th and early 20th centuries. In 1905, the California legislature unanimously passed a resolution calling on the government to limit immigration, characterizing Japanese immigrants as “immoral, intemperate, quarrelsome men bound to labor for a pittance.”1 The next year the San Francisco School Board created separate schools for all children of Chinese, Korean, or Japanese descent. Japan understood these measures to imply that the Japanese were still not on equal footing with the Western powers. They felt that, as an industrialized nation, their nationals should not be grouped with people from China or Korea. In the aftermath of World War I, US President Woodrow Wilson had tried to appease the Japanese by allowing them to write an equality of races clause for the League of Nations charter, which would read “that the principles of equality of nations and the just treatment of their nationals … [shall be] a fundamental basis of future international relations in the new world organization;”2however, the measure was never voted on. From Japan’s perspective, the last insult from the United States came when Congress passed the Immigration Act of 1924. This act is also known as the Japanese Exclusion Act since it plainly states that although immigrants from other nations would still be admitted on a revised quota system, no more Japanese immigrants would be admitted to the United States. This, coupled with America taking a protectionist stance after the stock market crash of 1929, caused Japan to turn further inward and focus on the consolidation of its own economic, political, and military sphere in Asia and the Pacific. In the 1930s Japan built a strong military government fueled by militant nationalism. The invasion of Manchuria and its transformation into Manchukuo led to censure by the League of Nations, which Japan then abandoned. It decided to control East Asia and spoke of an “Asian Monroe Doctrine” and later a “Greater East Asian Co-prosperity Sphere.” In his book War without Mercy, John Dower argues that Japanese thinking was characterized by an “intense self-preoccupation” that emphasized Japanese virtue and purity.3 Japanese citizens made sacrifices for the whole to prove their loyalty and spiritual commitment to the nation. They felt Americans were materialistic and egocentric due to their upheld values of capitalism, individualism, and liberalism. Thus, Japan began its drive towards joining the Tripartite Pact and entering World War II. The size of the Japanese presence in Seattle, as in most of California and Oregon, caused local residents no small amount of anxiety once war broke out between the United States and Japan. It is this anxiety, turned suspicion and fear, that a close analysis of the Seattle Star in the months after Pearl Harbor allows us to glimpse. On December 8, President Franklin D. Roosevelt signed the war declaration with Japan after he went before a joint session of both houses and pledged that the US would triumph over treacherous Japan, “so help us God.”8 The Star’s Raymond Clapper, also outraged by Pearl Harbor, was more far more bombastic in his prediction. “Japan has chosen to live by the sword and she will die by the sword,” Clapper wrote. “Japan will be blasted, bombed, burned, and starved. Her people will suffer ghastly tortures. A nation which had possibilities of becoming one of the rulers of the world will be reduced to a pitiful huddling people on a poor little group of islands.9” Clapper’s column, with its vision of “ghastly tortures” and of the Japanese as a “pitiful huddling people,” set the tone for much of the Star’s subsequent war coverage. 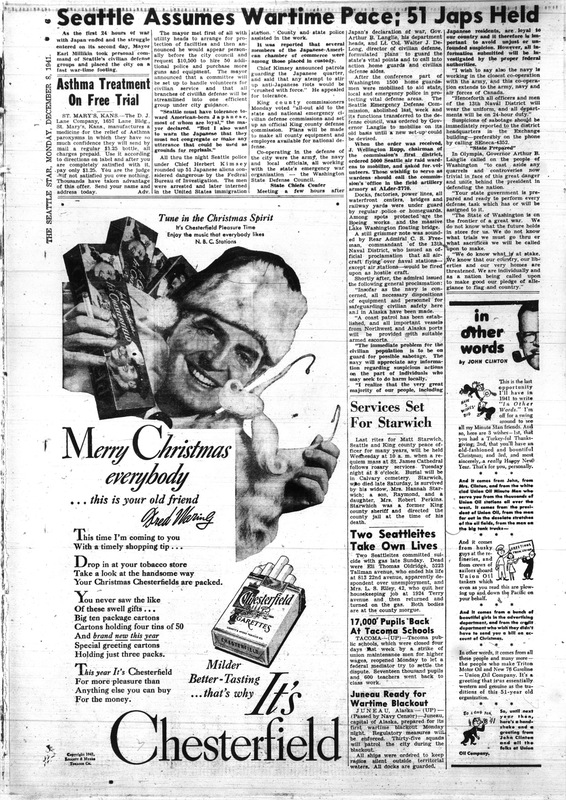 The day after the Pearl Harbor attacks, the Star also reported on its front page that Attorney General Francis Biddle announced that Federal Bureau of Investigation agents had “seized” 736 Japanese nationals in the United States and the Hawaiian islands.10 Here the language is significant. The word “seized” seems rather harsh when considering that the vast majority of those detained were innocent, law-abiding people. Yet many at the time felt that this extreme measure was necessary to protect national security. 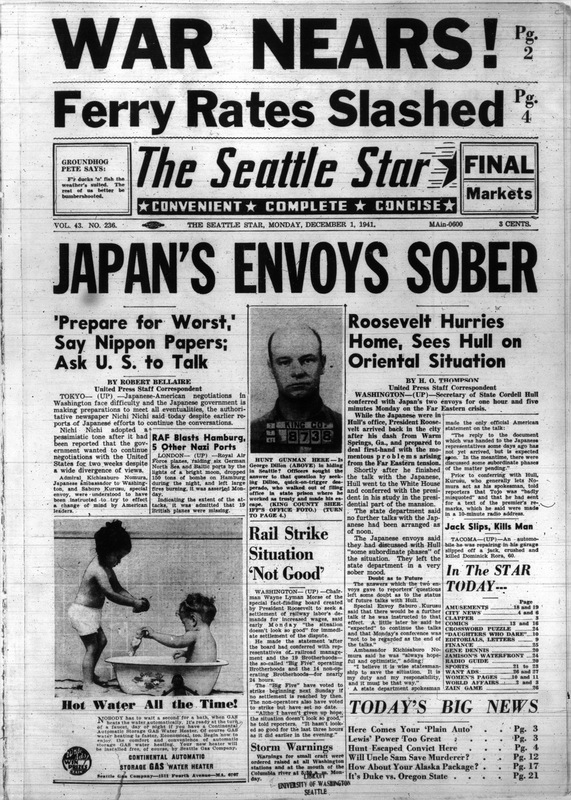 Other Seattle Star articles involving Japanese nationals and Japanese Americans included a report of Tacoma police seizing two Japanese loading motion picture films into a car in a “dark alley,”20 an article about special passports being given to Japanese wedding guests stranded in Spokane, and a brief on Hiroshi Mashino, 25, who had just finished a national defense course and was set to work at an airplane plant, but was jailed with five other Japanese.21Although the latter two stories are fairly sympathetic to the Japanese sufferers, the phrase “dark alley” being used to describe the scene in which the Tacoma men where arrested again shows that, like Raymond Clapper’s column, the language used to describe the Japanese played into popular anti-Asian stereotypes. Although Seattle Mayor Earl Millikin took personal command of the city’s civilian defense groups and ordered 51 Japanese detained. He argued, “Seattle must have tolerance toward American-born Japanese, most of whom are loyal. But I also want to warn the Japanese that they must not congregate or make any utterance that could be used as ground [for] reprisal.”22 Seattle Police Chief Herbert Kimsey, who helped round up Japanese immigrants all through the night, also preached tolerance, declaring that any attempt to stir up anti-Japanese riots would be “crushed with force.”23The Star also chose to quote Rear Admiral C.S. Freeman, commandant of the 13th naval district, who said the “immediate problem for the civilian population is to be on guard for possible sabotage … I realized that the very great majority of our people, including Japanese residents, are loyal to our country and it therefore is important to avoid unjust or unfounded suspicion.”24 This view was also reflected by the Seattle Urban League, which urged citizens not to get involved in any measures and to allow the government agencies to handle the control measures.”25 By presenting these views and favorable comments about the local Japanese population the Star almost seems to be trying to convince individuals that they should be tolerant of others. 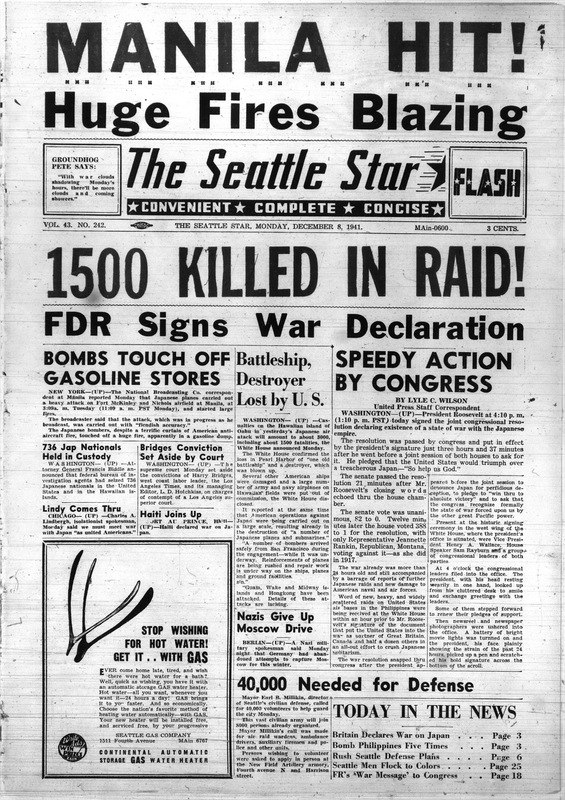 During this time local citizens’ fears grew, as evidenced by some rather ludicrous claims that were reported by the Seattle Star. One article featured an alderman, H D. Witon, who charged that Japanese wardens at the Boeing Aircraft plant had control of flashlights during blackouts and could signal to attacking aircrafts. Witon’s claim was taken seriously enough to be investigated by ARP officials.30Another article detailed how anyone who had spent the last five out of ten years in Washington State could withdraw a pension regardless of citizenship. The Star seemed to be suggesting with this article that that should not be the case. Another strange story was a letter written by a W.D.M. who said that on December 1st, the Japanese Hotel Association had said “‘for various reasons we are obliged to raise you rent $1 more per month.’ On December 7th, the Japs began war upon the United States. Perhaps it can be investigated.”31W.D.M seemed to be suggesting a conspiracy was afoot between local Japanese American businessmen and the Japanese military. There are many stories of abuses of and discrimination against Japanese-Americans. Much of it apparently without thought and foundation. Let’s not do that any more. Many of them are Christians and good Americans. Think of yourselves in their position. It’s tough. Japanese-Americans can do much to help themselves by wearing a pin, “I am an American-Christian” and reporting all subversive acts, and those engaged in them. That is the plain duty of every American. It is striking, though, that both of the selected letters refer to churches or Christians. What of the many loyal Japanese-Americans who were not Christians? At the start of the New Year, Japan was advancing into Burma, having already captured Manila, North Borneo, and Rabaul. The British were forced to withdraw into Singapore and a siege of Singapore began January 31st. Still, the United States was confident that it would win the war. The economy at home was finally booming due to the war after more than a decade of depression. And Japanese internment was becoming an accepted idea among many as an answer to the perceived threat of espionage and subversion. On January 2nd, the Seattle Star reported that President Roosevelt had confessed his concern “over the increasing number of reports of employers discharging workers who happen to be aliens or even foreign-born citizens.”34 Roosevelt, who issued the executive order authorizing Japanese internment, went on to say, “it is one thing to safe-guard American industry and particularly defense industry, against sabotage; but it is another to throw out of work honest and loyal people who, expect for the accident of birth, are sincerely patriotic.”35 Star reader Joseph E. Mackinsly agreed with the president, writing that “[t]he mixing and blending of these peoples thru native born or naturalized citizenship is what makes us Americans … what we need in this country right now is fewer morons in executive positions.”36 Mrs. C. E. Baum shared this view, stating that “[o]ne hears of Japanese school children being forced off buses by schoolmates undoubtedly influenced by ignorant parents … racial persecution has no place in the American way of life, as it is the various contributions of each race which makes the United States the unique nations it is.”37 This sample of the readership and the _Star_’s decision to print them left the impression that the paper was on the side of the Japanese. However, aside from these letters to the editor from concerned citizens, very few news stories documenting the harassment faced by the local Japanese population appeared in the Star. It is as if the Star’s editors believed that such stories were not worth reporting. Also reported was an incident in which three American citizens and three Japanese nationals were indicted by a federal grand jury in connection with the illegal distribution of pro-Japanese propaganda.44 A follow-up article on four Japanese accused of conspiring to export military equipment and munitions to Japan was also printed. Although the headline of the later article ran “4 Japanese accused of conspiracy,” it concluded by saying that a Russian, an Englishman, and Japanese who failed to comply with the alien registration act were also indicted. In other words, although the conspiracy allegedly involved people from several nations, the Japanese were singled out in the headline. Let us to be able to say ‘We did it,’ instead of ‘We should have done it’! Let’s move the West Coast Japs inland before they move us! (that would be a good slogan) Canada decided on this move, and Russia used this plan to help her defeat fifth columnist activities on her borders. It would be a big job, no doubt and would be very expensive, but we have such a beautiful country, and so many precious lives at stake – we just can’t afford to over look any bets. Another letter to the editor, this one by a Ruby L. Salmon, shared this sentiment, arguing that “all foreign born American-citizens … [and] school-children should be asked to speak American … on the streets. When in America do as the Americans.”46 Contrast this with the earlier letters, quoted above, praising the contribution of Japanese residents to America’s celebrated diversity. One striking story reported by the Star was that of a group of Gatewood mothers who sought to dismiss the female Japanese clerks who worked in the school district. The mothers, members of the Parent Teacher Association (PTA) collected signatures to petition the school board. Mrs. Dale J. Marble, President of the Seattle PTA council confirmed that the council representatives had twice protested the employment of Japanese girls.62 The twenty-six girls finally resigned, declaring in their blanket resignation, “we take this step to prove our loyalty to the school and to the United States by not becoming a contributing factor to dissention and disunity when national unity in spirit and deed is vitally necessary to the defense of and complete victory for America.” The Seattle Star deserves credit for posting the girls’ opinion and the reasons why they resigned. [I]n regards to the removal of all Japanese and their allies on the Pacific coast, if we don’t [move them], they are liable to move all of us. My wife and I have raised a family of boys and girls here in the northwest who are now raising their own families and buying their own homes. All the boys are of draft age, registered and ready to go and fight to preserve the freedom of our country and what it stands for. As a citizen and taxpayer who has a stake in these United States, I believe it would be best for the welfare of our people that all enemy aliens be removed to a place inland where they could do no harm. Fear of offending has cost our country plenty especially in regard to Japan. We are inveterate appeasers, and sentimental and the Japanese and their allies have not the word sentimentality in their vocabulary. Germany proclaimed the death penalty for anyone helping an American or their allies. When we put our enemies in a safe spot inland we will be safe from within. Don’t let us be sentimental fools all our lives, remember what the Japs did to our 30,000 Americans in the Far East so they lost all business and families ties. Also what they did when they conquered Manchuria in 1932. For heaven’s sake don’t let that happen here. Although the Seattle Star is just one newspaper, and Seattle is just one city, this analysis of the Star’s coverage of the Pacific War and the issue of Japanese interment offers an interesting vantage point from which to view of evolution of both the newspaper’s and the general public’s views of Japanese Americans over the first two months after Pearl Harbor. The letters to the editor give perhaps the clearest indication of this evolution, which corresponded with the change in ownership of the Seattle Star in January 1942. Overall, the letters went from asking for tolerance towards Japanese residents to calling outright for internment camps and expressing increasing alarm about the threat of Japanese people in the United States. It was this fear, a fear that was directed toward Japanese people in ways that it was not directed toward either German-Americans or Italian-Americans, that led Seattle officials to abridge the rights of Japanese immigrants and Japanese-American citizens and, on a national level, led to Roosevelt’s executive order authorizing wartime internment camps.